The last week and a half has been extremely hectic for me. I feel like I am not getting enough rest, I'm extremely drained but yet I still have to try to keep up with all the work I have to get completed. I know one of my main errors is not drinking water. I have never been a water drinker. I played sports from an early age all the way up to college and I was still not a water drinker. I go to my yoga class with no water. Sometimes I would not even drink anything at all for the day. No juice, no tea, no coffee, no water. Suddenly at about 2 I realize I'm parched, lips are dry and run to get something to drink. And first choice would be some coffee, tea or juice. I know I need to drink more water. I can see the effects of the lack of water around me. My skin is dry. Not excessively, but I do use coconut oil (I would probably use it even if my skin was extra moisturized) before I use lotion. My face is dry. And I obviously don't have that much bathroom visits. When I do get extremely dehydrated I go get a huge bottle of water and drink it right away and that would be it till the next time I get dehydrated. A few days later perhaps. So I am on the quest to try to improve my water intake. I have been on this quest before. I have tried "water enhancers", I have a water infuser bottle but I still cannot seem to keep up with drinking a glass much less 11 glasses a day. 1. Drink a glass of lukewarm water with fresh lemon first thing every morning. Apparently this gets your organs going and lemon is detoxifies and aids in digestion and cleansing. 2. Keep a bottomless bottle on your desk. Have a large bottle on my desk to sip at all day. When the water gets down to a certain point refill. Water will always be at hand. 3. Get a fluid companion. Always have a water bottle on me where ever I go. Slice fresh cucumbers, ginger, limes, lemons, or fresh strawberries and toss 'em into your water for added flavor. You can also use mint leaves, cinnamon sticks. Frozen fruit is also good for ice replacement. 5. Drink water with a straw. Drinking through a straw helps you drink larger amounts in a shorter period of time. I am already a watermelon freak so this should be good. And with it being summer... YUM!! Also include more celery and tomatoes and oranges. Try drinking plenty of water between or before meals, not just while you eat. 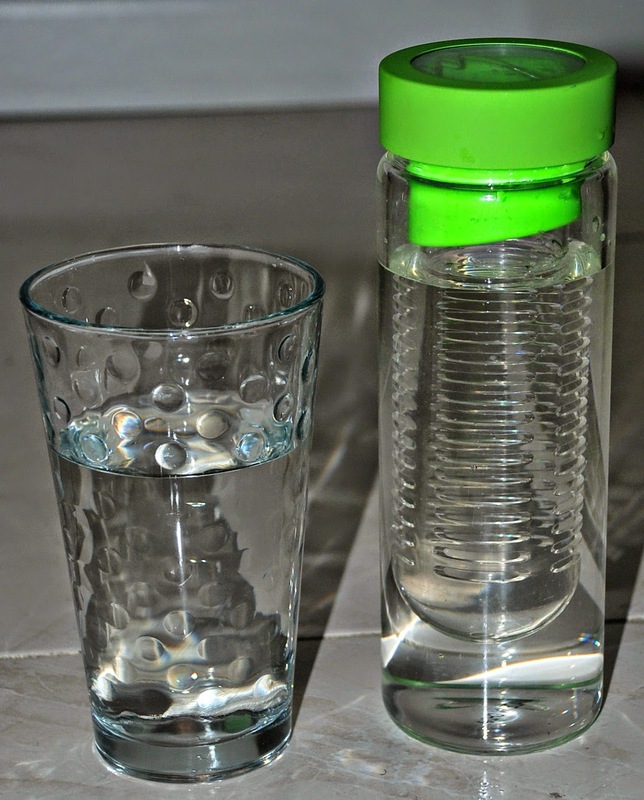 Make a rule for yourself to drink a full glass of water before every meal and at least half of a glass with every snack - it's an easy reminder to stop and hydrate. Plus, guzzling more liquids helps to curb hunger which can sometimes be disguised as thirst. Stay better hydrated and lose extra pounds while you're at it! 8. Cut back on the caffeine. Drinks like coffee and soda have a diuretic effect and cause the body to eliminate more water than they bring in. So do your body a favor and every time you think about reaching for juice, drink some water instead. If you're a juice, iced tea, or lemonade drinker, dilute half with water-you'll still get the flavor without all the calories, and you'll be sneaking in more h20. 11. Out on the town? Drink water. We're not necessarily condoning booze, but if you find yourself going out for cocktails, make sure you always-without fail-drink a full 8-ounce glass of water after every drink. This not only slows the absorption of alcohol, but it aids in preventing dehydration. 12. Track intake with apps. I am going to be using Water Intake Tracker to keep track of my water intake. Do you have any tip and tricks that I can add? Well I happen to love water =) but even I have been slacking lately! I plan to use some of these great tips! I really hope it works. If i can get to 2 bottles a day for now I would be very happy.